For people in advertising, this has meant a shift towards constant vigilance and trying to instantaneously shift gears. Unfortunately, not all trends are wise for every business to follow. 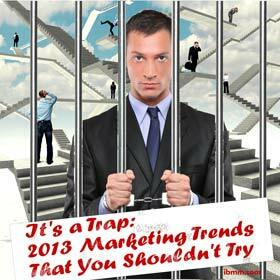 Here are some of the top marketing trends of 2013 that you need to be careful with, and may want to avoid altogether. Optimizing everything all the time. SEO has become such a ubiquitous and arguably important aspect of making yourself known on the web that proponents are suggesting that businesses use keywords everywhere. That means not only on the static pages of their website and in blogs (which makes sense), but also in things like white papers, emails, newsletters, in guest posts, and even in the blurb that you create when you put your company into directory services. In theory, all of these mentions of “Idaho cheap tires” will raise your profile and bring more people to your business, but companies would be wise to remember the reason why search engines keep changing the way they decide rankings—too much of something adds up to a whole lot of nothing and turns off consumers. Ignoring campaigns. With the instant feedback businesses have access to in today’s marketplace, some gurus are suggesting that companies eschew the marketing campaign altogether and simply act (or, rather, react) based on how people are responding in real time. The problem with this “fly by the seat of your pants” methodology is manifold. First, people tend to be incredibly fickle, and if you’re trying to do an about face every time something seems to change, you’re going to end up chasing your tail. Second, advertising is a creative endeavor; you can’t just pull good ideas that stick with people out of the air—at least, not on a consistent basis. Should your campaign have flexibility? Sure. But don’t simply decide not to come up with one. Just creating content. We’ve moved into a phase of marketing where both everything and nothing is an advertisement at the same time. What does that mean? Well, experts know that people don’t want to be sold all the time (which you really shouldn’t take an expert to tell you), so they are convincing more and more companies to focus on creating quality content and making themselves experts in their respective field. This is done through methods such as writing blogs, submitting guest posts on other big sites, creating and giving away white papers and eBooks, and generally just providing people with information and entertainment for free so that they’ll like and respect you and (hopefully) keep coming back. Eventually, the point of this is to slowly lead people toward your products and services so that they’ll be more likely to buy from you when they get there. 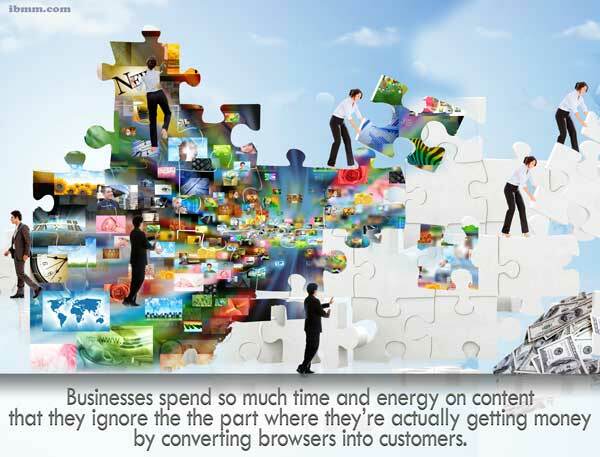 But the problem is that a lot of businesses spend so much time and energy on the first half of this process that they ignore the second half—the part where they’re actually getting money by converting browsers into customers. Get people to like you, sure, but don’t forget that you need them to pay you, too. Nothing but mobile. If you’re in advertising or own a business, you’ve seen the trends: people are using mobile more than ever before, and the numbers just keep going up by leaps and bounds. Companies that ignore the mobile market are doing so at their own risk, because that’s a lot of people to just write off. In fact, you might be smart just to put all of your marketing resources into mobile and really work to build that audience. While mobile is certainly important, no one short of a few companies whose entire demographic is mobile should forget about the rest of their audience—which, by the way, is still the vast majority of almost every single company’s customers. Yes, mobile is growing by leaps and bounds but it’s still just a fraction of the rest of the market.